11-19. And it came to pass, as He went to Jerusalem, that He passed through the midst of Samaria and Galilee. 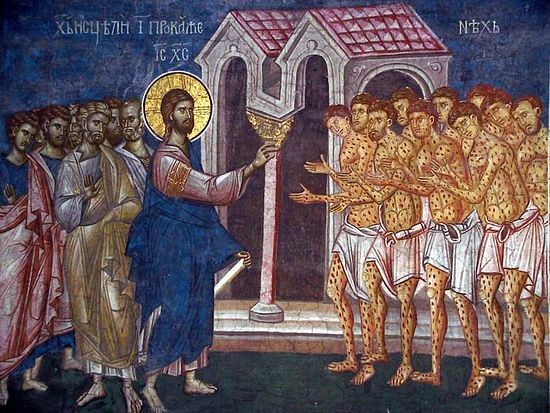 And as He entered into a certain village, there met Him ten men that were lepers, who stood afar off. And they lifted up their voices, and said, "Jesus, Master, have mercy on us." And when He saw them, He said unto them, "Go show yourselves unto the priests." And it came to pass, that, as they went, they were cleansed. And one of them, when he saw that he was healed, turned back, and with a loud voice glorified God, and fell down on his face at His feet, giving Him thanks: and he was a Samaritan. And Jesus answering said, "Were there not ten cleansed? But where are the nine? There are not found any that returned to give glory to God, save this stranger." And He said unto him, "Arise, go thy way: thy faith hath made thee whole." From this one may learn that nothing prevents a man from living in a manner pleasing to God, not even if he belongs to a despised race, if only he has a good will and disposition. For behold, ten lepers met Jesus as He was about to enter a certain city. They met Him outside the city, for those who were considered unclean were not permitted to go into the city. They stood afar off, as if ashamed of their supposed uncleanness, and did not dare to draw near, thinking that Jesus abhorred them as did the others. They lifted up their voices and made supplication. By physical location they were standing afar off, but in their supplication they were near. For "the Lord is nigh unto all that call upon Him in truth" (Ps. 144:19). And they did not make supplication to Him as to a mere man, but as to One greater than a man. For they called Him "Master", meaning Lord, Protector, and Guardian, which is not far from thinking of Him as God.